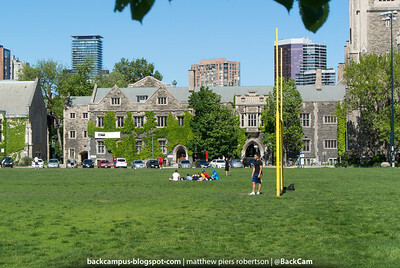 The Long Version: According to the University of Toronto, their "Downtown Toronto (St. George) campus blends historical architecture and inviting green spaces as a backdrop to a truly remarkable community." 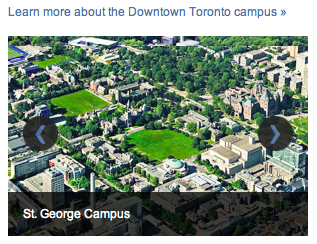 The lead photo is theirs, and it shows a neighbourhood awash in significant architecture and large green spaces. There's a big round one in the middle of the photo, which is used for ceremonies and frequently fenced off for rehabilitation, and there's the big square green space on the left side of the photo. That's Back Campus, but don't get too attached to it. 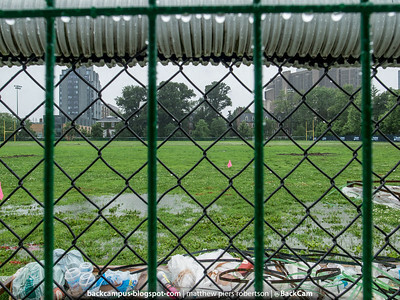 In anticipation of the Pan Am games, the University will be spending millions of dollars to dig up two grass turf playing fields and replace them with an artificial turf surface. Confusingly, and possibly in honour of George Orwell's legacy, the University invariably refers to this simply as "turfing", and not in the sense of 'turfed him off of the governing council'. To avoid the confusion of their replacing one kind of turf with another, I'll be calling the mowable surface "Grass" and the future material "Plastic." That seems fair. The outline of the project is that two playing fields will be changed from grass to a plastic surface. The existing field is lined with trees on three sides, both young and old. 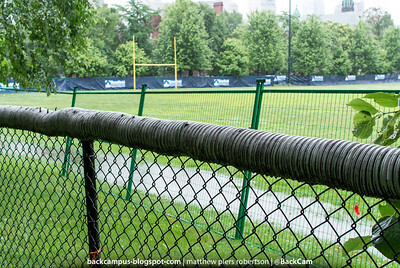 There's a nice iron fence on the north end of the field and a rather unappealing black chain-link fence with a plastic dryer vent duct along the top – as protective padding, presumably – closing off much of the remaining perimeter, with the quarter facing the main campus left open as the only access. The existing grass does get a lot of traffic, and even as a community member I typically use the field with one eye on the frisbee and another looking out for ruts, puddles, and dips. The replacement plan is to move the formal boundaries (and fence) almost to the very perimeter of the playing surface, keeping the existing trees and grass on the outside and installing plastic on the inside. The idea is that this will provide a hard-wearing surface that's suitable for international field hockey competition one moment and casual baseball games the next. The University of Toronto, an institution renowned for promoting critical thinking, has published a great deal of material talking about what a great deal this is. Much of the financial cost will be paid by other people, community access will be retained, none of the existing trees will be harmed, no chemicals will be needed to maintain the surface, and it will be able to be used year-round. Their material doesn't contain one single downside; there's not even a slight shrug and an admission of 'well, yeah, that one little part might not be so great when it's all done.' It's lollypops and bonbons for everyone. Naturally, others have stepped into the vacuum to provide a countering opinion. The unambiguously titled Keep Back Campus Green website contains a collection of their own articles as well as links to ones published elsewhere, both pro and con, regarding the project. The formal plans, organized opposition, and outside opinions provide a good diversity of material. I've read a lot of it, and I'm pretty sure that the "the truth is somewhere in the middle" folks have something on their side in this debate, but I don't think that it makes any difference. The University does need a better playing surface; I'm willing to accept their assertion that grass is not up to the challenge. But the argument of necessity doesn't stop their plan and actions from being fundamentally and inherently evil. The University should step up, own it, and say, "we need this anyway". Or even better, "we need this anyway, and here are all the great things we'll do elsewhere in the campus to mitigate its effects." 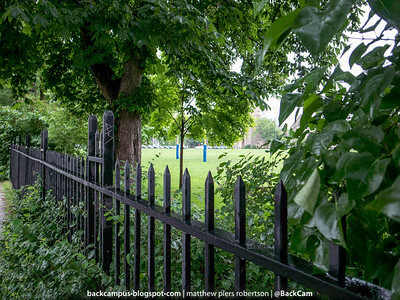 The replacement of two grass playing fields by what is essentially a carpeted parking lot simply can't be morally neutral even if all of the other possible negatives of the project – damaging century-old Elm trees, removal of smaller trees on the border of the field, application of biocides to the playing surface, massive water use, restricted student and community access, among others – are avoided. Is it plausible that paving over the large field that currently absorbs and slowly releases rain water to the surrounding trees somehow won't damage them? Instead of this natural system the University will be installing a large under-field cistern to slow the flow of storm water before it inundates the aging municipal network of combined sewers. That isn't nearly as good an answer to the problem at all. Has any project of this scale worked out according to the best-case projections that are created to steer it through the planning and approvals stage? We're just one minor engineering requirement away from losing dozens of trees that line the perimeter; once ten million dollars are spent on a world-class competitive surface will the department of Kinesiology still want to leave it unlocked so that people who just happen to live in the area can toss a ball around on a saturday afternoon? I don't believe it for a second. 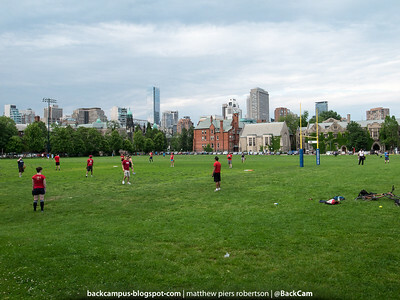 Less than two-thirds of a kilometre from Back Campus, or about a five minute walk, there's a large grass playing field. 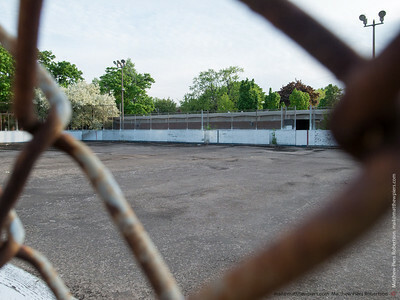 It's controlled by the U of T affiliated University of Toronto Schools (UTS) private high school, and it's kept locked and unavailable to the community when it's not being used for a few hours a day during the school year. Given Toronto's recent water infrastructure projects to deal with storm runoff, the reviving interest in Toronto's "Lost Rivers" – such as Taddle Creek, whose watershed this is – and mandated efforts to create green roofs to combat the urban heat island effect, even the best case scenario that the University proposes is exactly the wrong answer. Toronto's downtown core, of which the St. George campus is a major part, already suffers from a lack of public space, insufficient parkland and green space, and inadequate civil infrastructure to serve the demands we already have. Regardless of the stated need for better athletic facilities, and the impending arrival of the Pan Am / Parapan Games in 2015, the University of Toronto's decision is a massive failure of innovation and leadership. This simply isn't the way we build cities any more, and the University of Toronto should be championing innovative solutions here just as much as they do in other areas. Taking such a regressive action in the heart of the most significant university campus in Toronto deserves to haunt their reputation for decades. I am chronicling the University of Toronto's Back Campus Fields Project, the conversion of Back Campus from grass to plastic, on a dedicated website: backcampus.blogspot.com.